Taylored Expressions Blog Hop – Wheely Great! Welcome to the Blog Hop sponsored by Scrapbook Adhesives by 3L® and Taylored Expressions! If you came from Charmaine Ikach’s Blog, great! If not, that’s great too. You can start today’s hop at the Scrapbook Adhesives by 3L® blog here, and follow along. And don’t forget to comment on yesterday’s projects, you can start on this post at Taylored Expressions. Comments that enter you to win will be accepted through July 19, 2013 at 10am CST. 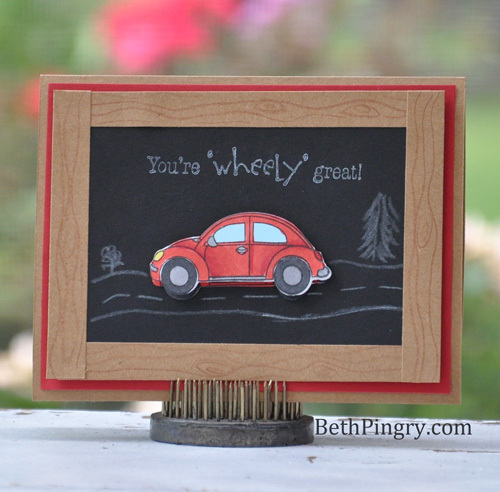 The stamp set I selected from Taylored Expressions “Wheely Great” brings back memories! Back in the stone ages, you know, high school, my dad bought a VW Bug convertible. It was 15 years old, stick shift, and the floor was rusted out. There was no heat, which didn’t quite work out so great with Chicago winter weather and cheerleading uniforms. But, it was the coolest car ever…when it worked. He spent weekends repairing it and swearing at it. I was the only one of my sisters that could drive the stick shift, so guess who had the most fun? Sure, they had fun in Mom’s “Family Truckster” station wagon, but everyone wanted a ride in Murphy (that’s what we named her, based on Murphy’s Law, everything that could go wrong on that car did go wrong)! So I just had to have this set and smile when I think of all the shenanigans with the Murph. I wanted to create a chalkboard effect, so I used kraft paper to make a frame, a colored pencil for the wood grain. Plain old black cardstock for the background, and a white colored pencil for the road, etc. All the flat items have been adhered with MyStik™ Permanent Fine Adhesive. I stamped the car with Memento ink, colored with Copic markers and layered for dimension with 3D Foam Squares. I stamped the sentiment with Stazon Opaque Cotton White ink. 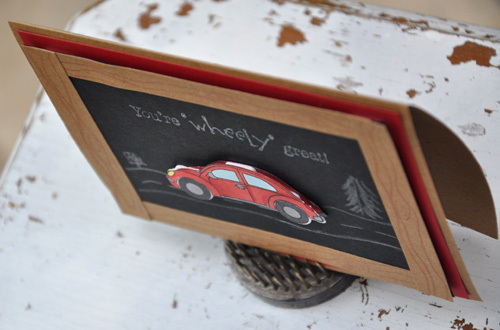 Here you can see the 3D Foam Squares I used to lift the car and the ‘chalkboard frame’ off the card base. Thanks for indulging my today, and remember to leave a comment to enter to win a stamp set/die from Taylored Expressions and adhesives from Scrapbook Adhesives by 3L®. The next blog is Stephanie Kraft! Have a great day and thanks for coming by!